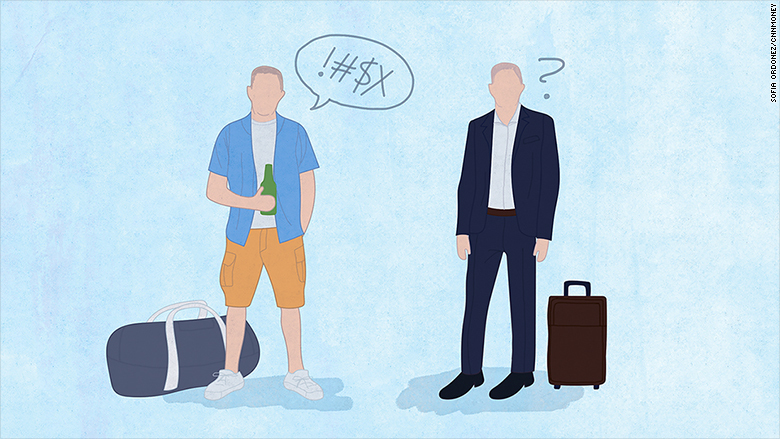 Business travel is demanding, but when your boss is your travel companion, it can become downright stressful. And just because you're on the road, that doesn't mean it's time to slip into vacation mode. "It's still business. What you say and do can come back to haunt you," said Barbara Pachter, author of The Essentials of Business Etiquette. Have the money conversation at the office. Meet with your boss before the trip to determine who will be booking tickets, scheduling meetings and making payments on the trip. "The senior executives or owners oftentimes are going to pay for everything themselves," said Diane Gottsman, owner of The Protocol School of Texas. "There are times when he or she would just prefer you to handle the details." Always show up first. Plan to arrive at the airport, hotel, meetings and events ahead of schedule, advised Gottsman. "Don't keep the boss waiting ... you are responsible -- whether they say it not -- of keeping the itinerary." She also advised knowing the address and directions to the entire day's events. "You don't want to ask your boss, 'where are we going?'" Sit together until you're told not to. If you're making the travel arrangements, ask the boss if he or she wants to sit together. But when in doubt, the protocol is to sit together, the experts advised. "When you are sitting next to the boss, follow the boss's lead, don't pop in ear buds and go to sleep. They may or may not want to talk a little business," said Gottsman. "If he or she pulls out a book or magazine, then you can do the same." If you're already running late to the airport or the breakfast buffet, walk over, say hi and take a seat if there's room -- unless the boss is reading or on the phone, advised Gottsman. "A better way is to say, 'do you want to meet for breakfast or meet in the lobby?'" she said of coordinating the next day's schedule. Be social, but don't overshare. Don't hide in your hotel room every night. You don't have to participate in group dinners every night, but at least one is a good idea. "It's an opportunity to meet people that can be helpful to the company or your career," said Patcher. While being social and networking can be a career booster, sharing too much information can have the opposite affect. "If you wouldn't say it in the office, don't say it outside the office," Pachter added. Lay off the booze. Even if you're off the clock, limit your alcoholic intake. "It's still business," said Pachter. Gottsman added that waiting at the airport bar is probably a bad idea, unless the boss proposes it. But moderation is key. Dress appropriately. Lucky you if the business trip is in the Caribbean, but that doesn't always mean it's time to break out shorts and flip-flops. Find out the dress code and determine the event's tone to pack appropriately. "If it's a major conference... with leaders from across the field and world, you want to dress nicer. If it's your department or company, business casual has more leeway," said Pachter. "But do not dress in a sloppy manner." Be aware of your attire even during down time, because there's always a chance you might run into your boss. "Don't go out into the pool in the smallest bikini you can get," said Pachter.